CCR Build 167 was released earlier today. Here's a very quick overview of some of the changes. I'll do a more indepth post soon! The bad news.... Build 167 still doesn't allow the Imagine to cut. Thank you so much for doing this for us. You both are VERY helpful and caring people and I TOTALLY APPRECIATE it. Question...I opened CCR for the first time in a few months. When I finally had time to scrapbook i clicked on my CCR icon and it prompted an update. So i accepted. Then it prompted an Adobe Air update and I accepted. Then it looked like it was running through 2 installation steps. Then it stopped 1/2 way through step 1 and said PnP driver installation stopped working? How can I fix this? My CCR will not open...so sad! I need to scrapbook. Thanks if you've got any suggestions! Hi thanks for the update on the new patch, you mention the new update does not fix the Imagine to cut issue, did it break the working 1.32? I literally cut a project this morning, then came back in the afternoon to another project and my Imagine won't cut again. It is the same problem I had when I updated to 1.51. 1: If you have a problem with the installation I suggest uninstalling CCR and Adobe and and downloading it again. 2. I'm not sure why 1.32 would stop working unless there was a change to ccrbridge.exe. I'm not aware if there was though. I downloaded the new version of CCR because I have not used it since january, and did not realize it wont let my imagine cut! i tried to download your files for the old version from on of your previous blogs but it says your files are out of bandwith! do you have any suggestions? I am a teacher and bought digital cartridges for my classroom now I cant use them! Yep, my bandwidth got eaten up when I shared the links to the DS updates last week. I would suggest you give PC a call. They'll be able to give you the link for where you can download Build 132. Hopefully they'll finish updating all the broken links soon! I was so disapointed that I could not get my images to cut! I am setting up my classroom tomorrow and kids start on monday so Hopefully PV can help me out ASAP! this is all so new to me! Thank you for getting back to me so fast! I will be calling them first thing tomorrow! Hey ! I was wondering if you had tried to use the layer option since the update. I've tried using it and I can't get the layers to size correctly. I tried using the same method as the Gypsy and I still get inproportionate layers! I can't find any help anywhere! Im sure its something easy that I'm overlooking ! Thank you!! Do you see (because I cannot find it anywhere) the option to separate layers/manipulate images using "edit contour"? I kind of use it heavily! yikes. The layering seems to be working fine for me. Make sure you have clicked on the Aa (Relative) button below the keypad before you place any of your images on the mat. You can also set the default size of your base layer there. 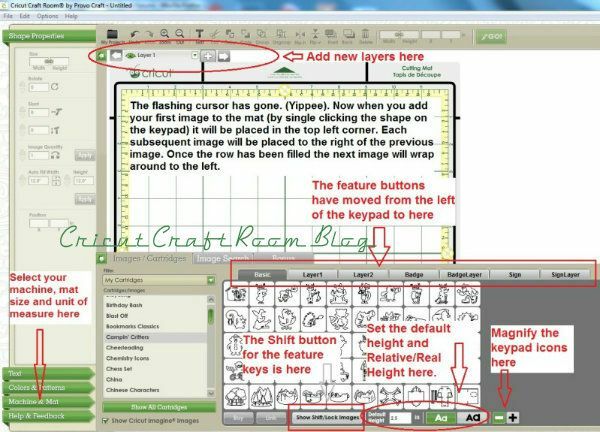 Don't forget, if you want to resize your layers after you have placed them on the mat, you'll need to select all the images (Ctrl A) and resize them all at the same time. If it's an image from an Imagine cartridge you will see an Edit Group button instead. Click that then you'll see the Combine/Separate buttons. Hard to believe they are still having issues with the imagine....shesh. Thanks for the helpful info. I just downloaded Cricut Craft Room for the VERY first time last week to use with my imagine and was so disappointed when I could not for the life of me get it to cut. The first few times the screen just said 'checking mat status' forever and did nothing but then I finally got it to load the mat and I thought it was going to work finally-but then it just spit the mat out. I didn't realize when I downloaded CCR that it didn't work with the imagine-they have the option of choosing the imagine mat though so I am confused. I have been trying to find some answers online and I came across your blog. This was the first I have read that says the newest version of CCR doesn't work with the imagine. (Thank you SO MUCH for all of your work in keeping up this blog by the way since Provo Craft doesn't seem to care much about customer support and making products that work correctly!) I was just wondering if someone could give me a brief run down about CCR and the problems with the imagine. I have been trying to find info but all I can gather is it doesn't work with the newest version of CCR. Did the previous versions work with the imagine and allow the imagine to cut images? Thanks again for the help!! Something went very wrong with the Builds after that and so far PC haven't been able to fix it. I'm hoping that it's on their list of priorities because otherwise anyone who only has the Imagine is plain out of luck. You can download Build 132 and try that out. Unfortunately the link in my post currently won't work as I exceeded my box.net bandwidth for the month. The new month starts in 2 days so hopefully it will be available again then. I think I'm just going to get rid of my Imagine and buy the Expression 2...again! It is a total bummer not being able to use CCR with the Imagine, and apparently I'm not savy enought to be able to use the Imagine by itself. I love CCR.